↑ Simonetti, G. (1990). Stanley Schuler, ed. Simon & Schuster's Guide to Herbs and Spices. Simon & Schuster, Inc. ISBN 0-671-73489-X. ↑ 2.0 2.1 Alpinia. Flora of China. ↑ 3.0 3.1 Alpinia. Flora of North America. ↑ 4.0 4.1 Kress, W. J., et al. (2005). The molecular phylogeny of Alpinia (Zingiberaceae): a complex and polyphyletic genus of gingers. American Journal of Botany 92(1), 167-78. 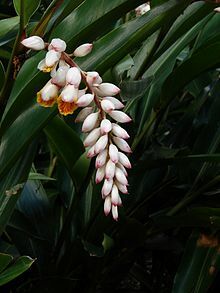 ↑ Alpinia. The Plant List. หน้านี้แก้ไขล่าสุดเมื่อวันที่ 29 พฤศจิกายน 2557 เวลา 21:02 น.